It’s that time of year again, when we look back to see what we have accomplished, and look forward to the challenges and opportunities of the year ahead. First, I want to thank all of you, the readers of this blog, for following me this past year. It has been an adventure for me. I hope that we will continue this dialogue for many years to come. It has been 9 years since my double diagnosis of Parkinson’s and Breast Cancer. Hard to believe that it has been that long. I am doing quite well, with my symptoms mostly relieved by medication and exercise. Of course there are ups and downs, especially while living with Parkinson’s. But for the most part, nothing holds me back. Mr. Twitchy and I have been traveling extensively, and plan to continue going places near and far, as long as we can. The best part: The continued growth of this blog has been a blessing beyound description. The ability to connect with so many, to share information — and inspiration — with each other, to confirm that we are not alone and that we are, in fact a community, has brought joy and meaning that is difficult to put into words. 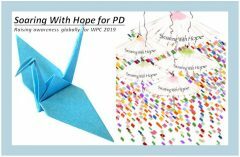 Let’s continue to read and comment and inform each other; and it would be a thrill to meet any (and maybe many) of you at the Kyoto World Parkinson’s Congress in 2019. The most humbling part: Being named one of Stanford Medicine’s Favorite Parkinson’s Blogs, one of Feedspot’s 50 top Parkinson’s bloggers (there are a lot of great bloggers on both lists, including many of the bloggers that I have been following since long before I began writing this blog) and being chosen as an official blogger for the 2019 World Parkinson Congress. The most exciting part: Working with the Parkinson’s Foundation to create the study Women & PD TALK, which grew out of the Women & Parkinson’s Initiative two years ago. Led by the Parkinson’s Foundation and funded through the Patient-Centered Outcomes Research Institute (PCORI), Women and PD TALK is the country’s first national effort to address long-standing gender disparities in Parkinson’s research and care based on the recognition that the disease affects the sexes in different ways. Its goal is to develop new patient-centered recommendations to improve the health of women living with Parkinson’s. It has been a pleasure to work with Allison Willis, M.D., University of Pennsylvania and Megan Feeney, MPH, Parkinson’s Foundation, two true luminaries in the Parkinsons world. We have been privileged to work with teams of Patient Leaders and Health Care professionals who are planning forums in 10 different locations. The first forum was in San Francisco in December and offered an exciting start that exceeded our expectations. The Women & PD Talk Forum in Los Angeles, on January 27, which I am honored to co-chair with Adrienne Keener, M.D. and Ali Elder, PT. This will be the 3rd of the 10 forums being held around the US. The anticipated report and recommendations from Women & PD TALK for improving care and outcome for Women with PD. Watching for, and sharing with you, the latest news on PD . We seem to be inching closer to finding the root causes of Parkinson’s and possible treatments to reverse the damage. Will this be the year for the big breakthrough? Oh, and we are expecting our 4th grandchild in May. So there’s that, too. Lots of things to share this week. First, about sleep problems. I found a Yoga Nidra meditation by Jennifer Piercy that I really like. It is called Yoga Nidra for Sleep and can be found on a website called DoYogaWithMe. I don’t think I have stayed awake until the end of the meditation yet. Now I just need my dog to sleep later in the morning so I can sleep in. Someone else mentioned that they like Jennifer Reis’s Yoga Nidra CD. I have not checked that one out yet. Second, Lisa Boyd, whose story I featured last summer, titled Did Trauma During Childbirth Set off her YOPD?, had an article published on the Michael J Fox Foundation website. You can read it here. This past weekend, the Michael J Fox Foundation hosted the Parkinson’s Policy Forum in Washington, DC. 200 members of the Parkinson’s community from across the US had the opportunity to meet with their congressperson and/or Senators after an intense day of training. Darcy Blake has written about her experience in her blog post Parkinsons Women Support. Thank you Darcy for your summary of the forum. If you would like someone to speak to a group about advocacy and lobbying for PD, check with MJFF to see who attended from your area. Finally, I will be working with the Parkinson’s Disease Foundation for the next two years on a program titled “Women and PD Teams to Advance Learning and Knowledge,” or Women and PD TALK . PDF received a $250,000 PCORI (Patient-Centered Outcomes Research Institute) award for this program in an effort to address long-standing gender disparities in Parkinson’s research and care. The press release went out yesterday and you can read it here. I am very excited to be a part of this project. Multidisciplinary teams, which include experts in the patient, research, and health care communities, will be charged with identifiying women’s needs and prioritizing solutions. 10 regional forums, designed to educate and collect the insights of women with Parkinson’s, will drive the project. Experts will utilize these insights to develop an action plan to change the landscape of Parkinson’s care. I am looking forward to sharing more with you as we proceed over the next two years with this exciting project.